At SweetTree we believe that with the right support package in place there is no better place to be than at home, and we see our role as assisting clients and their families to help make the decision to stay at home a little easier. 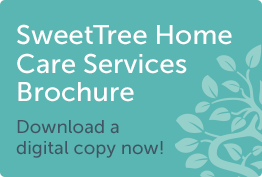 SweetTree’s live-in care service provides our clients with the reassurance of 24 hour support in the comfort of their own homes. It makes a huge difference to our client’s lives having that special person by their side offering a quality of life, excellent care and constant support – and often makes the fundamental difference between an older person needing to be placed in a residential care setting or being able to remain in their own home. We are committed to ensuring that all our live-in carer’s are appropriately skilled and experienced through rigorous recruitment and award winning training programmes. We provide a bespoke live-in care and support service that’s tailored to the individual needs of each client and we go to great lengths to ensure that each carer will fit in effortlessly with our client’s home life and situation. Our live-in care service allows people to enjoy an independent life in the comfort of their own home and around those they love most. We will do whatever we can to ensure our clients maintain a healthy, happy home life with choice and independence. Many of the initial calls we receive are from families who are unsure about the type of support they require, and are worried about having an as-yet unknown carer in their home. We understand. Our clinically led team are here to walk with you through the evolution of your care journey, to address your questions and concerns and to find the care – and carer – that is best matched for you and your needs. Long term – an alternative to residential care. Companionship and support with the comfort of remaining in your own home.